Make sure you are always using a sharp needle when sewing. That doesn't mean you have to change it every time you start a project, but when it starts to dull or you notice that it is having trouble going through the fabric then it is time to switch to a new needle. Blunt needles can cause problems like missing/skip stitching, snagged fabric and puckering. Make sure you are using the correct needle for the type of fabric you are using. Thicker, heavier fabrics and lightweight fabrics use different types of needles. Good quality thread will prevent a lot of problems with your machine. With Poor quality threads the problems that may arise are, thread breakage, poor tension, miss stitching and gathering. Personal favourites are Gutermann and Drima. If you accidentally prick your finger and managed to get blood on your fabric, use your saliva to wipe it. Wet the needle eye not the thread, moisten the eye of the needle with your finger and thumb. thread swells when you wet it and will not be so easy to pass through the eye of needle. 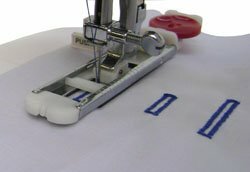 Can't sew in a straight line, from the needle position to the width required try putting a strip of masking tape over the needle plate or the flat bed of your sewing machine. Line up the edge of your fabric with this and start sewing. If the seams keep ripping in a certain area. Use the Stretch Stitch also known as a triple stretch stitch due to its three overlapping stitches, this choice allows fabric to give when pressure is applied. A good way to finish your stitching and prevent fraying, such as on finishing a buttonhole add a drop of clear nail polish. When the polish has harden it will secure the threads. Each thread has its own numbered tension control (same colour as the appropriate thread path) which are factory set for a balanced stitch and it is helpful to make a note of these numbers for future reference. The entry models have the "wrap around" front tensions which are on the front of the machine and providing the user makes sure that the thread is located correctly in the tension unit, threading is straight forward. The mid to upper range machines have the more user friendly "lay in" tensions which are situated along the top of the machine. 2 thread - uses one needle and the left (lower) looper threaded. This stitch is the most basic form of overedging and simply wraps the edge. Ideal for situations where you don`t want the edge to be too bulky. However, the seam will not be secure and a lockstitch would be required. 3 thread - uses one needle and both loopers. This stitch is ideal for overedging single layers but will need a lockstitch for secure seams. 4 thread - the most popular combination using 2 needles and 2 loopers. This can be used to sew secure seams as the second needle acts as a safety stitch preventing the seam from coming undone. 5 thread - these can have a variety of combinations but the most popular gives a straight chain stitch away from the overedging stitches. Most machines have an automatic button hole facility. 4 step button holes are common on entry models, where the user turns a dial to sew each side of the button hole. On higher end models, a 1 step button hole facility is common. The button is loaded into the button hole foot and the machine will sew the 4 sides of the button hole in 1 step to match the button. Lower priced machines will not have adjustable length and width controls. They will only have 1 dial on the machine for stitch selector, in which the width and length are preset. Some will have 2 dials, stitch selector with variable length. People who will be using more than just the straight stitch will find it a great advantage to have separate length and width controls. Unlike the front loading design, the bobbin case remains in place for threading and only has to be removed for cleaning. This system is easier to use as the bobbin drops in from the top and if fitted with a see thru plate, the amount of thread left on the bobbin can be easily seen. Other advantages are because the hook rotates rather than oscillates the machine is quieter running, causes less vibration and less likely to jam. Some manufacturers use a combination of the two and produce an industrial type system which is front loading but rotary. This mechanism has similar qualities to the top loading mechanism.